"A Keyblade imbued with wondrous power." 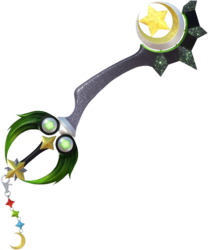 Phantom Green is a Keychain for Sora's Keyblade in Kingdom Hearts III. Phantom Green is an Xbox One-themed palette swap of Star Seeker. Its handle is black with a yellow crystal near the blade and yellow and silver stars near the pommel. The shooting stars that comprise the guard are green that fade into black, with the centers being silver circles with green crystals inlaid. The base of the blade is silver, and the blade is grey that fades into black. Set on the blade's tip are three dark green crystals, and on the teeth are a silver and gold moon and a yellow star. The Keychain's links are red, green, and blue, based respectively upon the B, A, and X buttons on an Xbox One's controller, with the Y button represented by the yellow moon that serves as the token. This page was last edited on 18 April 2019, at 21:26.